Parents of public school students in New York are up in arms over tests handed out that appear to contain paid corporate advertisements. Elementary and middle schoolers were puzzled when they noticed tests contained awkward mentions of brands like Nike, Barbie, Mug Root Beer and iPod, complete with registration trademark symbols. One mother Deborah Poppe, from West Hempstead, Long Island, claimed her eighth-grade son complained to her about named brands in the test. In one question a busboy failed to clean some spilled root beer — Mug Root Beer, to be exact, a registered trademark of PepsiCo. Others claimed Nike appeared in a question about being a risk taker and included the line: ‘”Just Do It” is a registered trademark of Nike’. Another parent commented that the plugs seemed out of place and added intentionally. “I’m sure they could have used a historical figure who took risks and invented things. I’m sure they could have found something other than Nike to express their point,” Staten Island resident Sam Pirozzolo said, according to the Daily Mail. 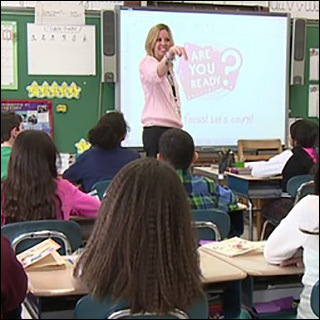 The standardized English test was administered to more than a million students from grades three through eight, and were only handed out in New York state. As for the appearance of trademark logos, a Pearson spokesperson said that’s just standard legal procedure when invoking specific brand titles. Pearson came under fire last year in New York City when reading and writing textbook shipments arrived late and were riddled with errors. The Common Core curriculum itself, another wonderful initiative brought to you by the Bill and Melinda Gates Foundation, has been accused of making kids dumber by making learning harder and more complex, and its lessons are frequently the target of online derision for featuring perplexing problem solving methods and hopelessly detrimental errors. That the initiative is being taken one step further by cementing a mindless consumer culture in the minds of children is just the latest icing on the educational tyranny cake.